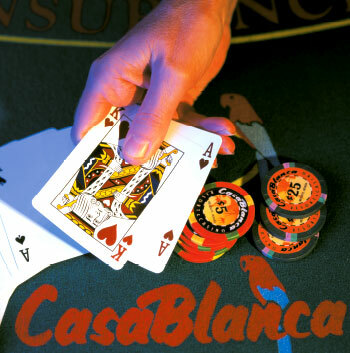 The CasaBlanca offers all of your favorite casino games in a warm, friendly atmosphere. Whether your action is slots, table games, or race/sports bets, the CasaBlanca Casino has it all. Over 800 of the most popular slot machines – Wheel of Fortune, Keno, Lightning Link, Buffalo, Video Poker, MegaBucks as well as many other favorites. Be in the middle of the action–watching the game, cheering for your favorite team, and making bets at the Casablanca Race and Sportsbook. Winning tickets can be cashed out at the cashiers cage after hours. Spin-n-Win up to $1,000 CASH! Did you spin today? Swipe your players card daily at any promotional kiosk and win up to $1,000 CASH INSTANTLY! Use your card when you play slots, table games, live bingo, keno as well as race and sports. You will earn points based on your play.